If your home or commercial property is experiencing frequent leaks it is a major indicator that it is time to repipe. Frequent leaks are usually caused by old pipes or defective pipes, like Polybutylene. Polybutylene should be replaced as soon as possible. Low water pressure is a key indicator there is a problem within your pipeline. Low water pressure can be caused due to a leaking pipe, corrosion or a blockage of some sort. The most noticeable place for low water pressure is usually the shower. If the water coming from your facets or showers is not clear and free flowing it is time to consider repiping. Reddish water indicates your pipes are rusting. Not only could they cause damage and leaks, it poses a health risk for you and your family. You've seen or heard about other properties of a similar age in your area needing a repipe. 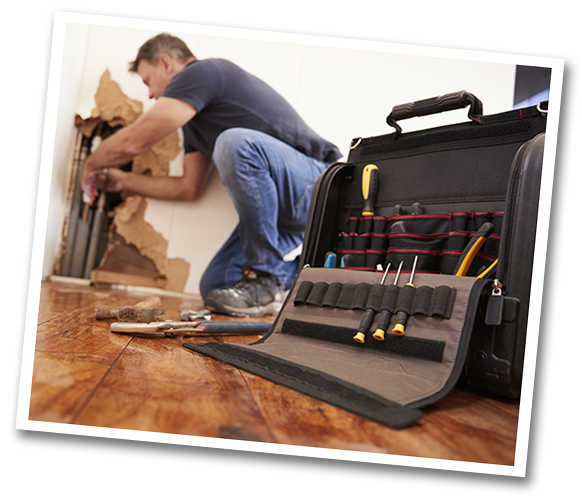 Small & minor pipe leaks can be patched with simple repairs. The same goes with clogs and slow draining issues, they are easily cleared, however a band-aid is not always the best solution. When you find your pipes are causing continual problems you know it is time to repipe. Repiping is much more cost effective than continually repairing pipes only to discover the temporary fix has caused extensive damage. Remember your pipes are under pressure, and your water will find other holes in the pipe. Once the band-aid is applied you will increase pressure and other holes will be created. Polybutylene is a plastic resin used to manufacture water pipes from 1975 to 1996. Inexpensive and easy to install, polybutylene pipes were used extensively in the construction of new homes in place of copper pipes. Soon after polybutylene plumbing became popular, the piping began to fail without warning, causing hundreds of millions of dollars in damage to people's homes. Failure was later attributed to interaction between the pipes and chlorine in public water systems, which caused the pipes to become brittle. Several municipalities and states banned the use of polybutylene piping because of its poor quality. How to Tell If You Have Polybutylene? Exterior - Polybutylene underground water mains are usually blue, but may be gray or black (do not confuse black poly with polyethelene pipe). It is usually 1/2" or 1" in diameter, and it may be found entering your home through the basement wall or floor, concrete slab or coming up through your crawlspace; often it enters the home near the water heater. Your main shutoff valve is attached to the end of the water main. Also, you should check at the water meter that is located at the street, near the city water main. It is wise to check at both ends of the pipe because we have found cases where copper pipe enters the home, and poly pipe is at the water meter. Interior - Polybutylene used inside your home can be found near the water heater, running across the ceiling in unfinished basements, and coming out of the walls to sinks and toilets. Warning: In some regions of the country plumbers used copper "stub outs" where the pipe exits a wall to feed a fixture, so seeing copper here does not mean that you do not have Polybutylene.